It's been awhile since my last Tuesdays at Ten June post, but that just means I've been hoarding up some good stuff to share with you today! And, um, P.S... you guys are really crazy talented. I am beyond amazed every time I see the projects y'all submit, whether they're featured or not. Keep up the good work, peeps! I'm a huge fan of the wooden bead chandeliers I've seen out in the retail world, but could never afford one. 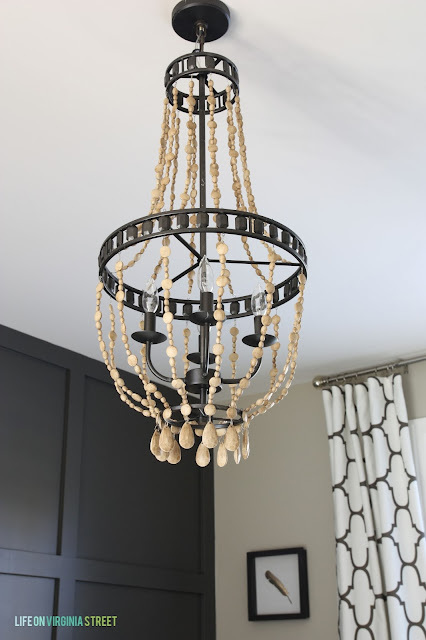 Sarah was in the same boat, but took matters into her own hands and created a DIY faux wooden bead chandelier. Seriously, this is legit gorgeous! Check out her great tutorial for more details. Y'all know I have baby girl nurseries on the brain right now... check out Lizzie's beautiful (and tiny!) baby girl nursery. Have you ever wanted to update one of your old kitchen appliances? How about some spray paint? Check out this genius mixer makeover by You're So Martha. I love this dining room makeover from Fabulously Vintage, especially when you compare it to the before! I'm a huge fan of using leftover scraps to create something beautiful for your home. And so is Amanda! Check out her latest scrap project- a DIY copper + wooden bud wall vase. SO cool! Hello, I kind of want to make a "wooden" beaded chandelier now, don't you?! If you've got any fun projects or DIY makeovers up your sleeve, send them my way! Send me photos or a link to your blog via email- tenjuneblog@gmail.com with the subject line Tuesdays at Ten June or tag your photos on Instagram with the hashtag #tuesdaysattenjune (make sure and include a link to your blog if you want me to link up!). Follow me on IG (@tenjuneblog) while you're at it! Thank you so much for including me! I'm honored be among these awesome projects, especially that gorgeous dining room and that vase! Holy gold polka dots Batman! I LOVE that nursery! And i want to cover a wall in gold polka dots!! Great features this week, Michelle -- have a good one! Thanks for including me Michelle! :) So many gorgeous projects!